Muslim fundamentalist rebels, including al-Qaeda, took revenge Tuesday on West Aleppo for the heavy government bombardment of East Aleppo that has killed dozens in the past week, including at a hospital run by Doctors without Borders. 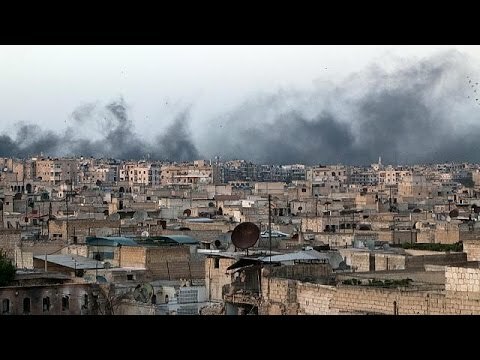 At the same time that the government was bombarding the slums of the east into yet more rubble, the rebels were lobbing mortar shells over on to the upscale West, also killing dozens over the past week (though probably fewer dozens than the government did). On Tuesday the Nusra Front (al-Qaeda in Syria) and its battlefield allies of convenience staged an attack on the al-Zahra Cooperative district, deploying a car bomb and medium weaponry to take some buildings from government troops. But then the government called in reinforcements and halted the breakthrough. Then al-Qaeda and allies targeted al-Dabit Hospital with rockets, killing at least 3 women and wounding 17. Some sources alleged that al-Qaeda sent 60 rockets in short period of time into the center of East Aleppo, killing and wounding non-combatants. In sum, the insurgents killed at least 19 and wounded over 50 in these attacks on the West. It has a Christian population, which is terrified of the Muslim fundamentalist militias in the East. East Aleppo is a bombed-out slum. Estimates of its population run from a few tens of thousands to as many as 300,000, but in any case it is tiny compared to the government-held West. It is also miserable. Some neighborhoods are controlled by al-Qaeda, some by the hard line Salafi Jihadi “Freemen of Syria” (Ahrar al-Sham), some by militias of, essentially, the Muslim Brotherhood. It is being gradually surrounded by the Syrian Arab Army and its Kurdish and Shiite allies. At that point where Turkey can no longer send in ammunition and arms and perhaps even food, East Aleppo will go under a deadly siege. It should be remembered that most people who live there are not insurgents. They are just families trapped on the wrong side of the city. It is no longer easy to get out. I say all this because outside the newspapers of record, the character of Aleppo’s division is seldom stressed. That the West is the size of Houston isn’t mentioned. That the east is small and slummy and ruled by hard line Salafi fundamentalism isn’t brought out. You see headlines talking about the humanitarian disaster in the city (where renewed fighting has killed perhaps 250 in the past week), but it is hard to know what those headlines are talking about. West Aleppo suffers casualties but it doesn’t sound like it is exactly Stalingrad, at least nowadays. East Aleppo is regularly bombed by the regime and is probably the budding humanitarian disaster. But when al-Qaeda and its allies briefly cut off West Aleppo from food and munitions last October, before Russian air support allowed the Syrian army to restore the route into the city from the south, there wasn’t any outcry at all in the Western press. But far more lives were at stake then. I think East Aleppo has poor military prospects but a lot of sympathetic Saudi and Turkish press outlets. The poor people of East Aleppo are indeed in danger, and are being indiscriminately bombed, which is a war crime. But they are under the control of militias, some of which are, like, al-Qaeda or allies of it, and these are perfectly capable of war crimes, too, as with the rocket strike on Dabit hospital Tuesday. John Kerry has now admitted that in order for the ceasefire to be restored in Aleppo, the Muslim Brotherhood militias (the “Free Syrian Army”) are going to have to throw the Nusra Front (al-Qaeda in Syria) under the bus. Al-Qaeda doesn’t accept a ceasefire, doesn’t want it, and is actively disrupting it. Free Syria Army units like Division 19 have followed its lead. The way to forestall a humanitarian disaster in East Aleppo is for the fighters there to kick out al-Qaeda and dicker with the other side. Otherwise, darker times yet are coming to that part of the city.